A brief cool down and warm up activity to be spread over two classes. Students make predictions about the next class. At the beginning of the next class, you announce what actually happened, and see who made the most accurate predictions. Before class check the Nikkei, and the things that will change in relation to the first day. Look up a sports event, and plug the two teams into the highlighted areas on the worksheet. 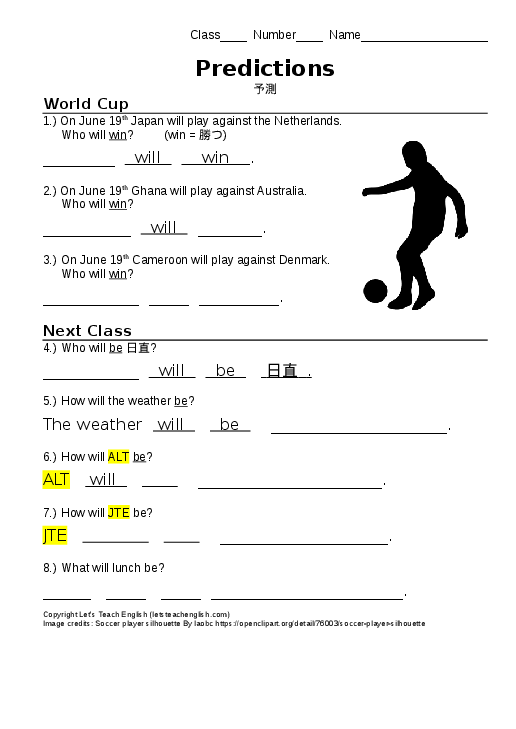 Hand out the worksheet at the end of the first class, and fill it out together with the kids. At the beginning of the next class, read the results of what happened, and find out which student made the most accurate predictions.